Chuwi Hi10 Air Tablet is a cost-effective notebook which supports fingerprint recognition. Equipped with a 10.1 inch FHD display with full IPS screen, brings your photos and videos to life. Powered by Intel Core processor, featuring Gen 8 graphics processor, ensures high performance. 64GB huge hard disk storage brings you smooth using experience. 2.4GHz/ 802.11b/g/n WiFi supported, ensures you high-speed surfing. Chuwi Hi10 Air adopts OGS full lamination technology to reduce the air refraction between TP and glass significantly, making the picture more vivid. Thanks to OGS tempered glass, the Hi10 Air’s high density LCD pixel is only 0.7mm, creating stereoscopic effect. Hi10 Air perfectly matches with the 10.1-inches soft keyboard, which is connected by docking port. Along with the Chuwi Hipen H2 Stylus, the Hi10 Air provides more comprehensive and effective usage for productivity and creativity. The combination of IPS display and OGS technology can show colors with unparalleled clarity, 178° viewing angle will give you an amazing experience for watching videos and browsing. Hi10 Air adopts the metal uni-body design which went through 64 manufacturing CNC processes, the extremely thin 8.5mm metal body only weights 562g and makes it suitable for everyday carry backpack. Equipped Intel's advanced Cherry Trail CPU(up to 1.84GHz) and Gen8 HD Graphics GPU (up to 500MHz), Hi10 Air possesses powerful performance and fast processing speed to guarantee everything to run smooth. 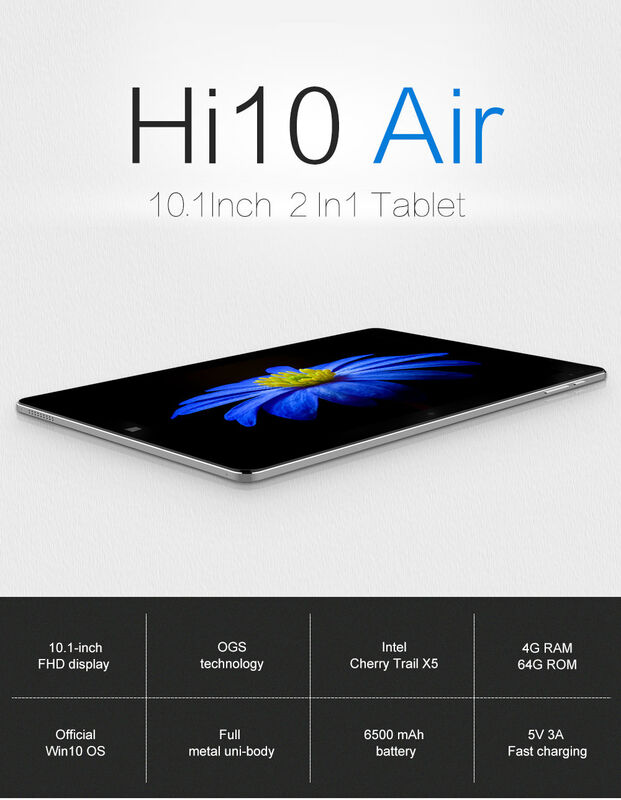 Hi10 Air comes with 4GB of DDR3L RAM and 64GB eMMC , reading and writing speeds up to 150m/s. With max up to 128GB TF card expandable storage, it meets your needs for movies, games as well as pictures. Pre-installed Windows 10 OS, Edge browser as well as Cortana will improve your work efficiency and give you the free choice between tablet mode and laptop, great for entertainment and productivity. Hi10 Air fully charges in just 3 hours thanks to USB 3.1 fast charging, and now supports data speeds of 10Gbps, you can charge it with a power bank without carring the big laptop A/C charger. Hi10 Air's keyboard dock brings back that familiar laptop structure required for productivity, the Hi10 Air can also be connect via Bluetooth for wireless support even the Xbox One controller. how to take good care with you smartphone? Turn On Night Shift Mode on iPhone, a safeguard solution for your eyes! Ideas on what I can do with my iPhone 1? Best offline racing games for Android?